The Sony W800 builds on the Sony W710 from 2013 and aims to provide a cheap opportunity for casual high quality shooting. The camera is well suited for taking pictures in open-air trips and walking around the city. Despite the fact that it has a smaller sensor, you can use the SteadyShot stabilizer to conveniently and precisely shoot even in dim lighting. With Sony CyberShot DSC-W800, you capture all the fun with one click and capture the whole scene even when shooting a video with a pleasant 26mm to 130mm (equiv. Center-focused autofocus lets you capture HD video (1280x720) at a rate of 30 frames per second. Whether you're taking photos on your night out or taking snapshots from your holiday, the W800 compact digital camera is literally packed with features that make sharp, beautiful photos and high-definition videos. With the camera's 26mm wide-angle lens, you capture the whole scene, not just part of it. Capture the beauty of each scene through a 20.1Mpx high-resolution image sensor. The lower resonance will allow you to better appreciate clearer mids and heights, and softer low-frequency sounds. Take out your W800 camera and instantly make a sharp and seamless video recording. With the touch of a button, you can capture 720 HD images without blur and with digital audio. The type-2.7 Clear Photo LCD screen lets you view photos and play movies with minimal effort. Enable the built-in party mode and let the camera automatically adjust key settings to create perfect and vibrant shots. Using the built-in image effects technology, you breathe the picture into a new life. There are a number of different modes available - there is no need to download the editing software. 2.7 " (6.86 cm) Done! HD (1280 × 720) Done! 29 MB (0.03 GB) Done! Strap, USB cable, Manual, Body cap Done! 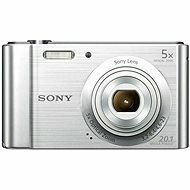 For shipping to other EU countries visit this page Sony CyberShot DSC-W800 - silver. Für Versand nach Deutschland, besuchen Sie bitte Digital-Kamera Sony CyberShot DSC-W800 Silber. Chcete doručit zboží do Česka? Prohlédněte si Sony CyberShot DSC-W800 stříbrný. Chcete doručiť tovar na Slovensko? Prezrite si Sony CyberShot DSC–W800 strieborný. Für Versand nach Österreich, besuchen Sie bitte Digital-Kamera Sony CyberShot DSC-W800 Silber.